A quick introduction to psilocybin for treating depression, for the State of Dis-Ease conference. Psilocybin for treating depression: a quick overview at the State of Dis-Ease conference in March 2019. ‘Depression can be a fatal disease. American novelist David Foster Wallace was one of its victims. He died of depression in September 2008. Read the full talk here. Featured on Cape Talk's Science & Tech slot on 13 Nov 2018. Cape Talk’s Pippa Hudson interviewed science writer Leonie Joubert about the opportunities to mainstream psilocybin-assisted therapy in South Africa. Cape Talk's Linzi Bourhill invited Leonie into the Cape Town studio to talk about the podcast, the underground psychedelic medicine community in South Africa, and the research coming from abroad which shows what an affordable and effective form of therapy this can be. The Psychonauts, on the PechaKucha stage in Cape Town. South Africa's Constitution upholds our right to healthcare. Given how unaffordable and inaccessible mental health treatment is in South Africa, having access to a treatment like psilocybin-assisted therapy becomes a Constitutional one. Early findings from clinical trials show that psilocybin may be more effective for treating some mood disorders and addictions, than current methods. But psilocybin is currently illegal in South Africa, making it impossible for therapists to include it in their treatment methods. A 2018 court bid to legalise the substance may change that. Science writer Leonie Joubert presents The Psychonauts on the PechaKucha stage in Cape Town on 7 November 2017. 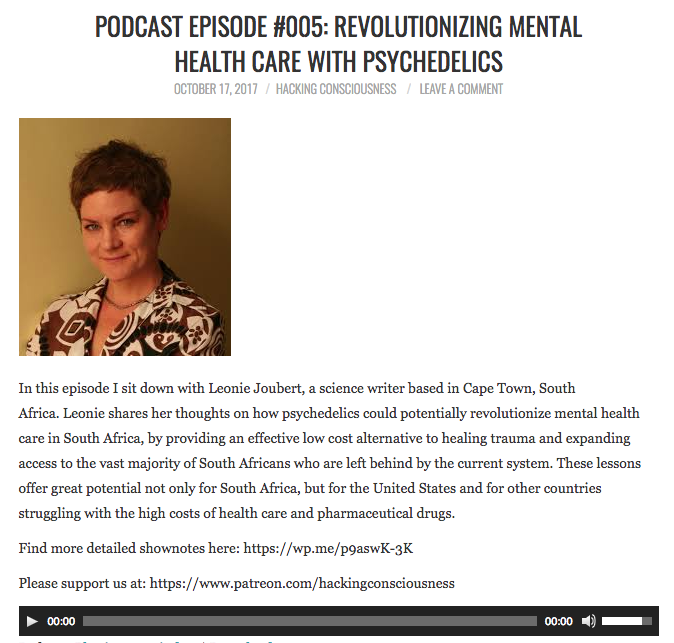 Leonie Joubert in conversation with podcaster Adrian Baker from Hacking Consciousness, on how to bring an affordable, accessible form of mental health care to traumatised Africans. A model for psilocybin-assisted therapy in a developing world context. Mike Wills, standing in for John Maytham, interviewed science writer Leonie Joubert about The Psychonauts, in August 2017. Therapy for traumatised South Africans? South Africa experiences excessively high levels of domestic violence - it's the bitter fruit of what happens when abused, traumatised, neglected boys grow up to become men. What if we could introduce this sort of therapy into South Africa? The protocol: a few counselling sessions, and just three sessions where you are dosed with the drug MDMA. Watch this deeply moving film about how two young men, whose psyches have been shattered by the trauma of war, are able to claw their lives back with this new form of therapy. Medical technology breakthroughs that we take for granted: birth control; c-sections; penicillin, cataract surgery. What if we had a similar breakthrough technology for the treatment of mood disorders and addictions? Our constitution upholds the right to have access to evidence-based health care... but what if our laws regarding certain drugs get in the way of that right? Next year, the Western Cape High Court will be asked to decide about psilocybin mushrooms. 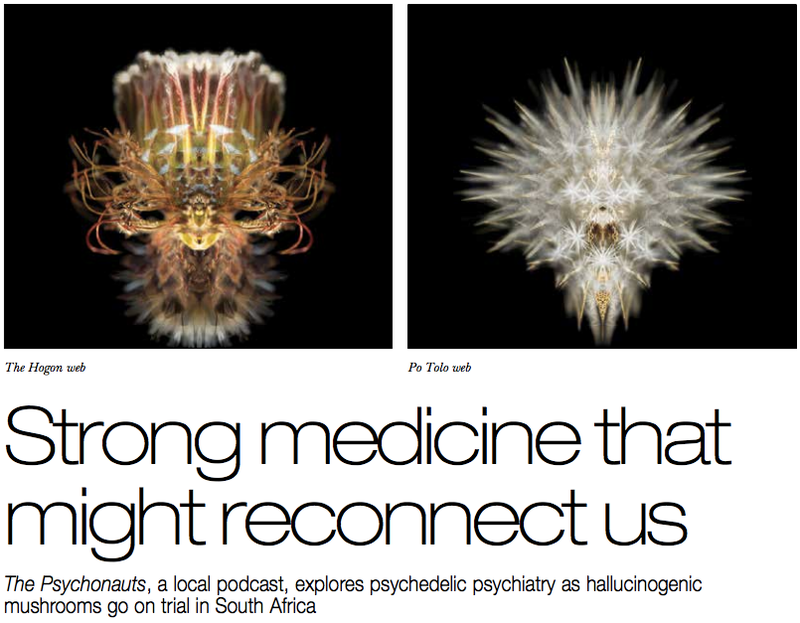 The Weekend Argus (Sunday edition), in a Q&A with science writer Leonie Joubert about The Psychonauts podcast, which looks at the therapeutic potential of psychedelics (psychedelics as medicine), ahead of hallucinogenic mushrooms going on trial in SA in 2018.